Well, that’s decisive, at least … care to expand? Well, there are few things in life more certain than being disappointed by an over-hyped, over-played and over-done restaurant. It happens all the time – a new place opens, everybody gets all excited about it, but it turns out to be just OK … not bad, not good, just OK, the sort of place that I just can’t bring myself to write about because it’s so, well, dull. Bundobust is not one of those place. It has indeed, and it’s easy to see why. This is a joint venture between the good people behind Prashad, late of Bradford, lately not quite of Bradford (that still hurts. Drighlington? Pffft) and the equally good people behind The Sparrow, a proper beer bar in the centre of Bradford that I privately gave five minutes before collapse, but which I’m extremely pleased to say is absolutely superb, and thriving. Both businesses have carved solid and sustainable niches, both doing their thing in a first-rate fashion, and their coming together in a joint enterprise like this in the middle of Leeds was always going to attract a little bit of attention. OK, that’s understandable, but it’s neither a bar nor a restaurant … what, exactly, is it? It’s definitely a bar, and it’s not quite a restaurant, but you’ll eat very well. No, I realised that as I typed it. 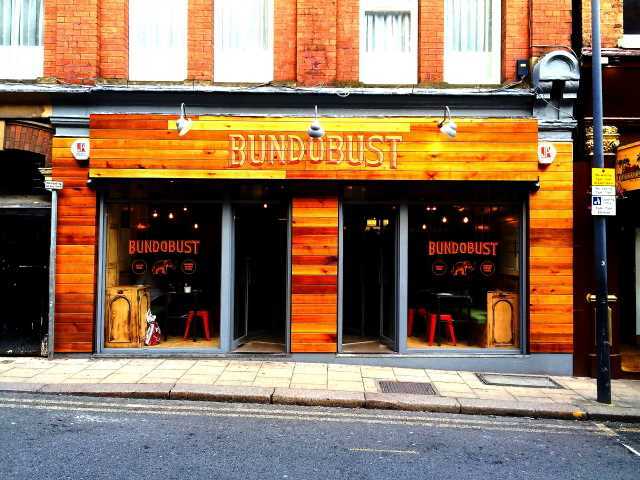 Bundobust is a hybrid type place. It’s focus is a bar stocked with a range of excellent real and craft ales, with a strong showing for northern breweries. That alone should be enough, but the second part of the one-two killer punch is a kitchen serving what amounts to Indian street food in small portions … small paper pots of vegetarian food that they affectionately refer to as ‘munchies’. This is where the real value lies, this marriage of proper, well looked after and carefully selected craft beer and extremely good Indian food. Each dish is about £3 or £4-ish, and I’d say maybe two or three might constitute a meal, four if you’re, well, me. It isn’t a massive menu, maybe a dozen or so small dishes, things like bundo chaat – a chaat made with chickpeas, potato, tamarind chutney and turmeric noodles, layered with crunchy samosa pastry or onion ghobi bhaji bhaji, which as the name suggests is a quite phenomenal onion bhaji. There’s also things like spice fried okra, and bataka vada, a heavily spiced ball of mashed potato coated in gram flour and deep-fried like a fritter. I tried a few dishes. All were great. There’s nothing bad on that menu. Just stick a pin in it and randomly choose. The design. Bundobust looks magnificent. It has loads of quirky and playful design tricks, including a wall made entirely out of reclaimed doors, cut up and nailed together, and cushions made of old rice sacks. The outside space is quite remarkable, what must have been a fairly crappy alley cleaned up and partly roofed over with corrugated plastic covering tables and benches. I imagine when it rains, the rain will flood down through the gap between the two roofs and splash onto the boarded floor below. It feels very Indian, authentically Indian. I’ve traveled a lot in India, and I’ve been to many places that look just like this, ingeniously thrown together from corrugated steel sheets and bits of other buildings, everything re-used and only just fitting in. I’ve eaten street food just like that served at Bundobust stood in the pouring rain under makeshift shelters in Delhi, pakora sizzling away in vast vats hot oil perched precariously on rickety stands. Bundobust took me right back to those places, and to create something as transformative, something as evocative in a slightly dingy side street round the side of the station in Leeds, formally infamous as the scene of the beginning of the end for the once mighty Leeds United is, in my mind anyway, a real achievement. All that, and the beer was far better than anything I’ve ever drunk in India. So, you’d recommend it, then? Well, yes, I would. I’d completely recommend it. It’s a huge hit, even more so because it does something genuinely different and hits the mark with a masterly style and class all of its own.